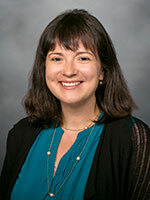 Dr. Esti Iturralde is a licensed clinical psychologist and Delivery Science Fellow at the Kaiser Permanente Northern California Division of Research. Her work focuses on how mental health factors complicate the management of complex patients, especially those facing chronic illnesses. She received her BA in the History of Science from Harvard University and her MA and PhD in Clinical Psychology from the University of Southern California, where her dissertation work was supported by a National Research Service Award from the National Institute of Child Health and Human Development. She completed clinical training in evidence-based mental health treatment and behavioral medicine at the Veterans Affairs Northern California Health Care System and the Stanford University School of Medicine. Her research uses observational, clinical trial, and mixed quantitative/qualitative methods to inform the implementation of evidence-based mental health interventions in specialty and primary care clinical settings. The Diabetes Strengths and Resilience Measure for Adolescents With Type 1 Diabetes (DSTAR-Teen): Validation of a New, Brief Self-Report Measure. ​Diabetes Educ. 2017 Apr;43(2):223-232. doi: 10.1177/0145721717697244. Avoidant coping and diabetes-related distress: Pathways to adolescents' Type 1 diabetes outcomes. ​Health Psychol. 2017 Mar;36(3):236-244. doi: 10.1037/hea0000445. Epub 2016 Nov 3. ​Diabetes Technology: Uptake, Outcomes, Barriers, and the Intersection With Distress. ​J Diabetes Sci Technol. 2016 Jun 28;10(4):852-8. doi: 10.1177/1932296816650900. Print 2016 Jul. ​A randomized clinical trial aimed at preventing poor psychosocial and glycemic outcomes in teens with type 1 diabetes (T1D). ​Contemp Clin Trials. 2016 Jul;49:78-84. doi: 10.1016/j.cct.2016.05.006. Epub 2016 Jun 4. Positive and Negative Interactions Observed Between Siblings: Moderating Effects for Children Exposed to Parents' Conflict. ​J Res Adolesc. 2013 Dec 1;23(4). doi: 10.1111/jora.12020. ​Youth exposed to violence: stability, co-occurrence, and context. ​Clin Child Fam Psychol Rev. 2009 Mar;12(1):39-54. doi: 10.1007/s10567-009-0040-9.